Theresa May didn't manage to convince her fellow EU leaders to grant her another Brexit delay until the end of July during Wednesday's summit - but they didn't exactly get the long-term delay that they had been hoping for, either. In the end, the two sides agreed to split the difference: An extension of Article 50 until Oct. 31, with a "review" in June where UK's compliance with conditions (holding EU elections) will be determined. European Council President Donald Tusk confirmed the agreement on twitter, just minutes after a flurry of media reports warned of the deal. Amazingly, the Brexiteer 'spartans' who refused to follow Boris Johnson and Jacob Rees Mogg in voting for May's deal on the third go-round are already calling on her to resign. 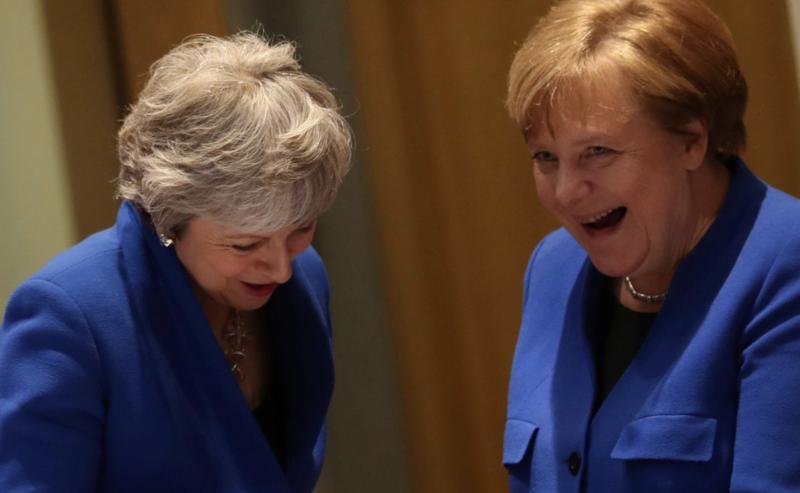 As the summit stretched into the late evening hours, media reports suggested that most of the EU leaders were in favor of a delay at least until the end of the year (and possibly until March 2020). If it's end of Oct with review at end of June, does that count as short or long? Longer than PM wanted, but shorter than she expected - surely not another classic EU fudge? Though there was one notable holdout: French President Emmanuel Macron, who reportedly insisted on something shorter. In the end, they apparently compromised. Supporting the notion that the pound had already priced in an extension, the reaction in the currency was muted. Though, as analysts from Bloomberg pointed out, one reason for GBP's staid response could be that the agreement leaves just as many questions as answers, as May could face a backlash - perhaps even a no confidence vote - if she fails to sell the deal to MPs. Though, in at least one sense, the long-term picture is becoming clearer. At least the long-term picture is clearing for investors. That is one where U.K. assets will need to trade with a discount to European peers because the political rupture which is taking place will need an entire generation to fix it. Now, will the public anger stoked by the 17 million who voted for Brexit be enough to push the Tories to vote for May's deal (and bring about an immediate exit from the EU?) Or, will May go the other way and use the time to build support (alongside Labour) for a second referendum?